Yet another protest, yet another high intensity drama. The thrill Indians used to find in India v Pakistan matches has now been replaced by the AAP v BJP battle. The AAP, after showing a lot of promise has suddenly lost a lot of credibility and respect, thanks to its dharnas and sloganeering over every small issue. What AAP is forgetting is that India can NOT be ruled by possessing the mindset of an activist. But then, they want to symbolize the anger of the suppressed, depressed and frustrated Aam Aadmi who has been assured by the constitution of the right to protest. But is it ALWAYS the Aam Aadmi Party that is at fault? Yes, it always is. 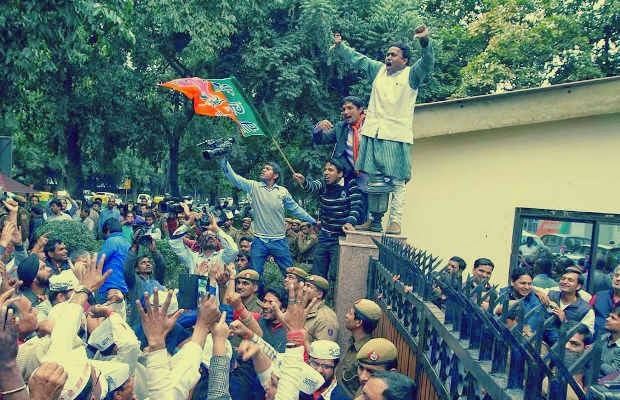 Try connecting the videos shown by news channels, and one can see it clearly- AAP members start protesting outside the BJP office in the presence of Delhi Police, enough to provoke the BJP members who feel intimidated and throw stones, chairs, tables and whatever ammunition they have inside their office premises. 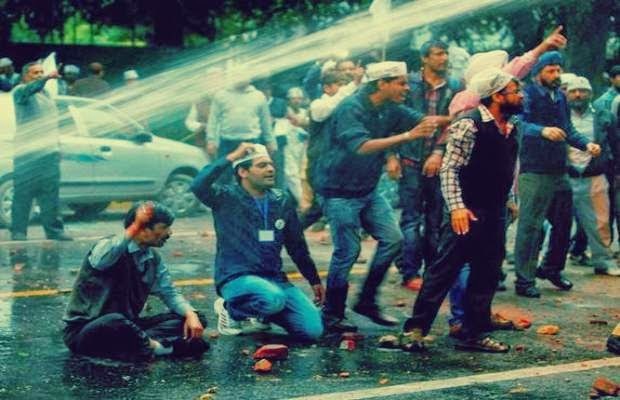 Shazia Ilmi is busy giving interviews, and then come the water cannons. Stones are thrown from each side, 10 coming out of the office and 2 going inside. 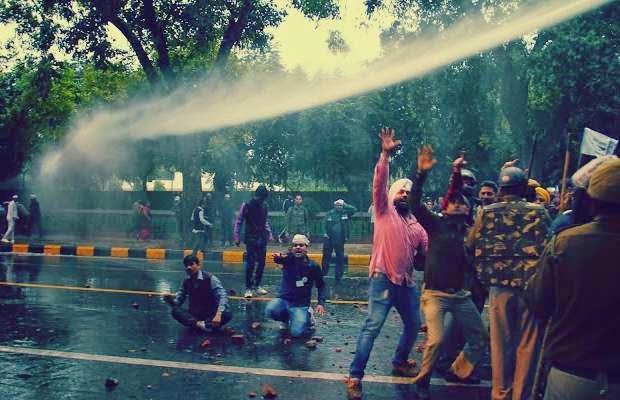 And then the frustrated AAP supporters try to take control over the water cannons. Now repeat this scene in the reverse order- that is national media for you. With so much of chaos in the videos shown on television, it makes sense to carefully find out who is actually throwing stones, and who is not. 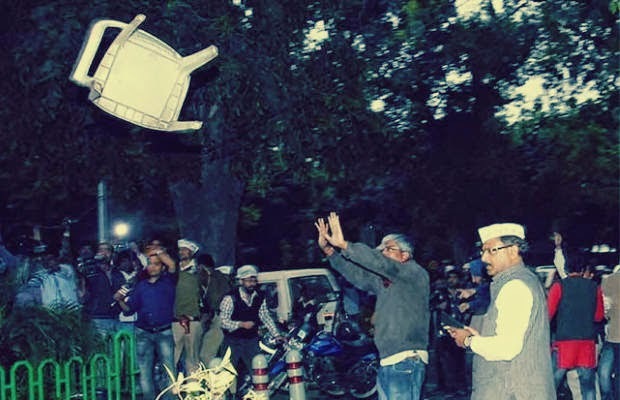 1) Ashutosh finding a chair on the road and throwing it inside the BJP Headquarters. Or maybe he brought this chair from home. Or maybe he asked the BJP Supporters to throw the chair at him so that he can sit outside and have a cup of tea, after all he was an uninvited guest. 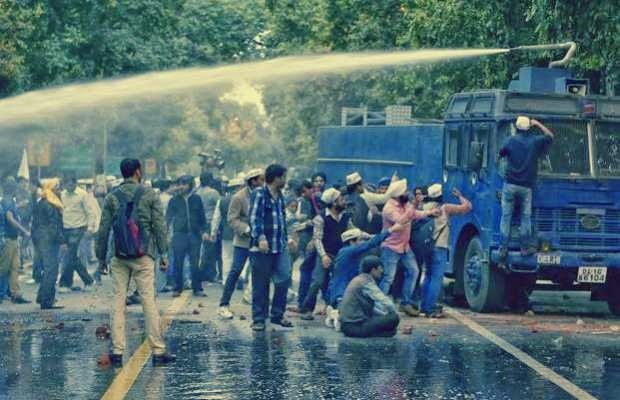 2) AAP supporters asking the water cannon operators to throw more water at them so that they can leave the place, after all the BJP did not even have the courtesy to even offer water to these guests. One person is so violent that he sits on the road, others are arguing with someone in the truck. 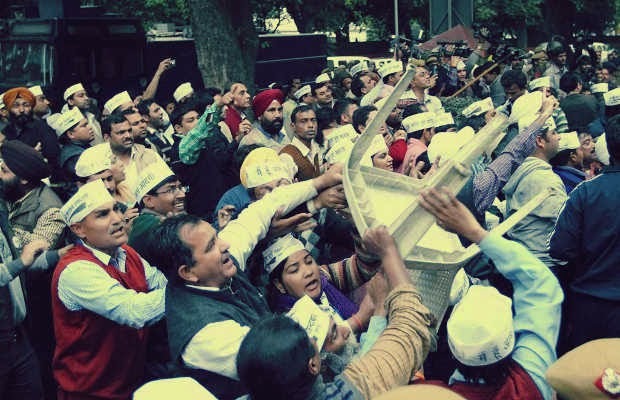 3) Another chair thrown from the BJP headquarters, AAP supporters try to catch it in an act of shameless violence. Shouldn’t such people who catch chairs on road be thrown into jail?! 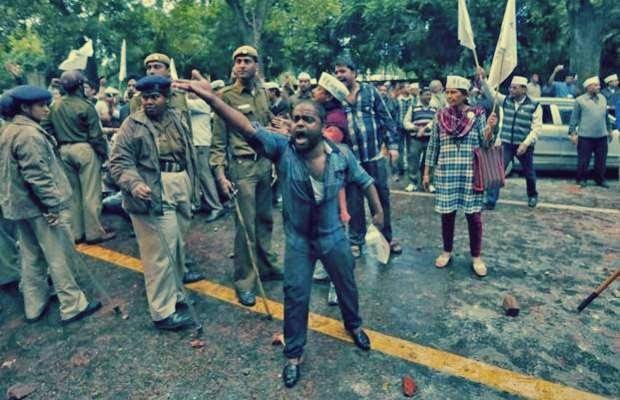 4) An AAP protester asking BJP supporters to throw more stones at him. A lady in the background wearing the AAP cap and holding a bag seems all set to blow the BJP office away. No wonder the BJP was scared of such AAP supporters. 5) Another AAP Suicide bomber swaying the ‘Jhaado’ flag and holding the bag carefully. Police realizes that she is the biggest threat here. Probably she is also one of the rioters who has been throwing stones and chairs right into the BJP office! 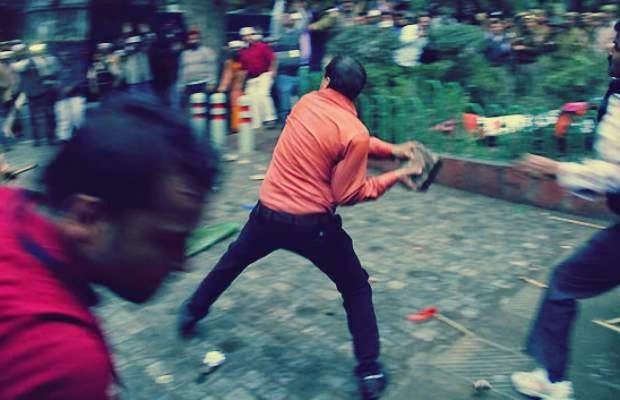 6) An AAP supporter comes out of the BJP Office and throws a stone at other AAP supporters. 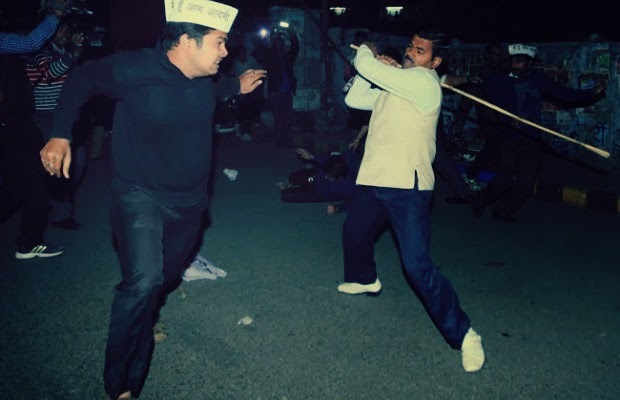 Another AAP supporter carrying BJP flags tries to stop this person. No wonder most of the stone were seen outside the BJP Office. 7) So a sardarji is trying to catch a stone. A policeman is seen doing the same. Another person standing behind is also pointing at someone. But the Delhi police logic says that ONLY AAP supporters were involved. Maybe this picture is photoshopped. 8) AAP volunteers collect a stock of stones and bricks to throw inside the BJP Office. A person on the extreme left probably wants to say something? Is he also involved in stone pelting? Or is he asking the ones throwing stones from the BJP office to stop this violence? No, he is an AAP supporter, he can never be right. 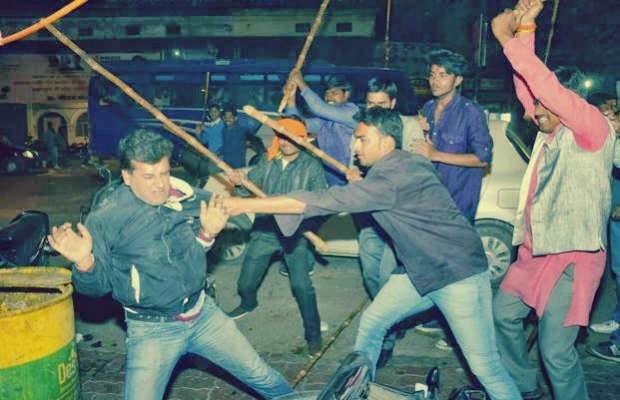 After all, BJP is the most non-violent party, history says it. 9) Look carefully at this picture. It says a lot. A police constable is running, no AAP supporter is doing anything to him. Ashutosh has an extremely weird expression. Not something that shows him inciting violence. Another policeman is looking at the ground, maybe something has been thrown from inside. Other AAP supporters actually seem to be standing close to the anti-riot van! The person on the extreme right seems like an extremely violent person as well. Classic proof that AAP was involved in the violence. 10) The person in the black shirt has a rod in hand. 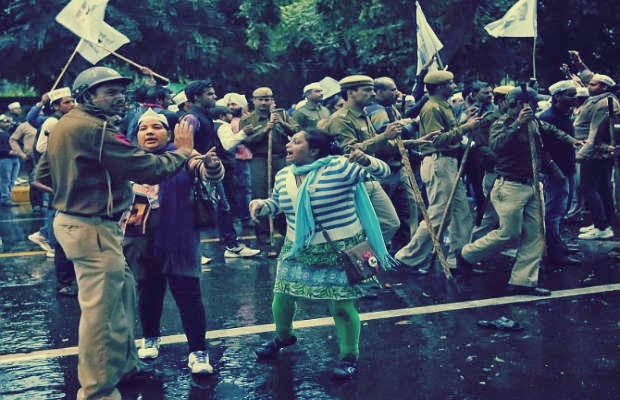 At the start of the protest, none of the AAP supporters had such ‘weapons’. 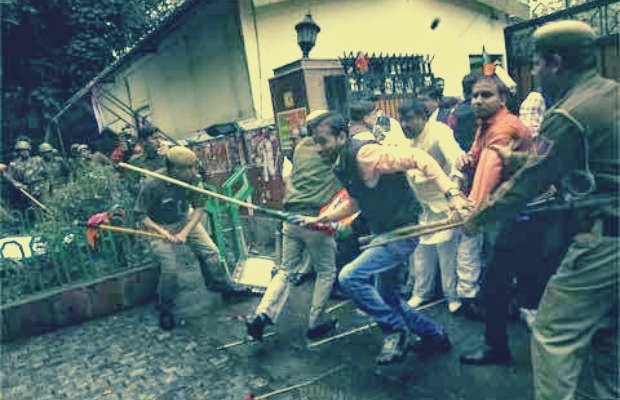 A careful look at all the videos shows this rod coming out of the BJP premises. Maybe the AAP supporter had asked for it. The lady crouching in the background has some dangerous strategy in mind, and the one standing right in front seems to be carrying a molotov to set the BJP office on fire. Here is the aunty’s molotov, a pack of files it seems. Nice weapon to intimidate the BJP members and start the violence. 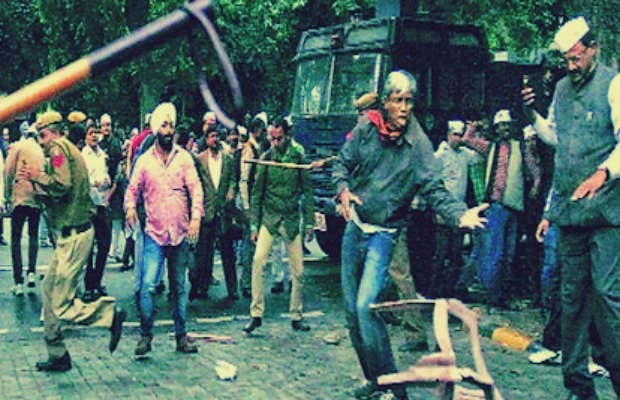 11) According to the police, it was AAP which provoked violence. Absolutely true it seems. 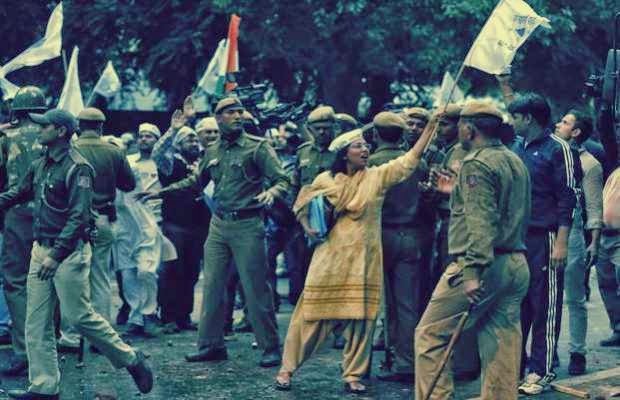 Never seen the Delhi police talking to patiently with people who actually provoked violence. What happened to your ‘Latth’, Delhi Police? So much of sympathy for violence instigators? Never seen something like this. 12) Yes, Mr. Ashutosh is the young blood of AAP these days. He was the one who tried to barge into the BJP office by climbing the wall. Yes, he is almost there, but why is he showing his hand? Asking people to stop him from entering? Or asking for a stone? Or maybe, this gentleman from BJP had actually been standing even before Ashutosh tried that stunt. 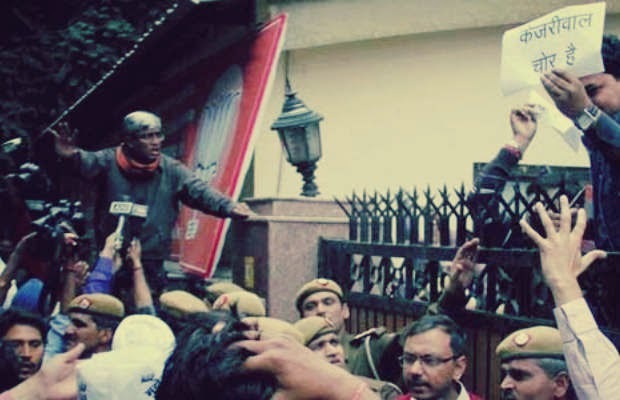 Does it really show AAP was barging into the BJP office, as they claim? 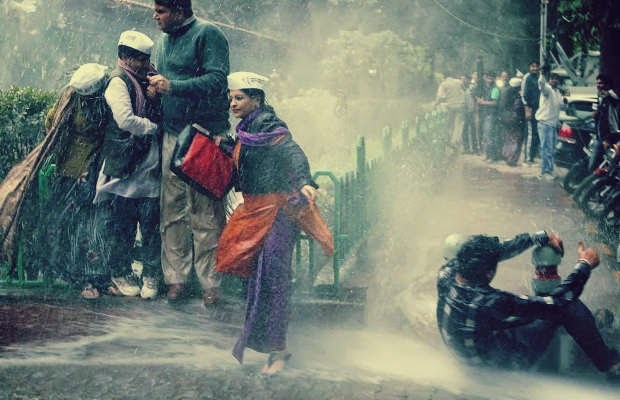 13) Shazia Ilmi, relaxing in the free shower sponsored by Delhi Police, after pelting stones. The old lady on the extreme left, another violent anarchist! 14) Now the trademark Lathis of Delhi Police can be seen! 15) And now the other side. 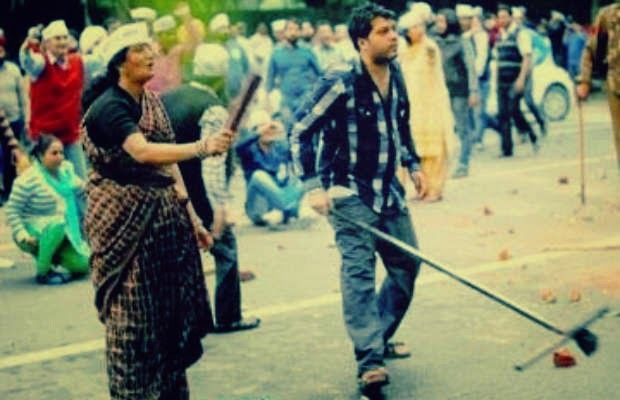 One act of condemn able violence which clearly shows AAP protestors also throwing stones. Who started? Very few can answer. But it was NOT just AAPs fault. And yes, the sardarji who was catching stones can be seen throwing the same here. 16) And some more to show why AAP is wrong. 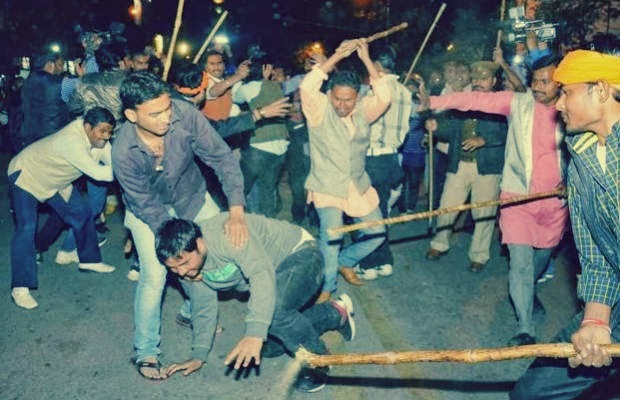 After all, the BJP has never indulged in violence. 17) The helplessness of the police. 18) The Hindu saffron brigade at work. 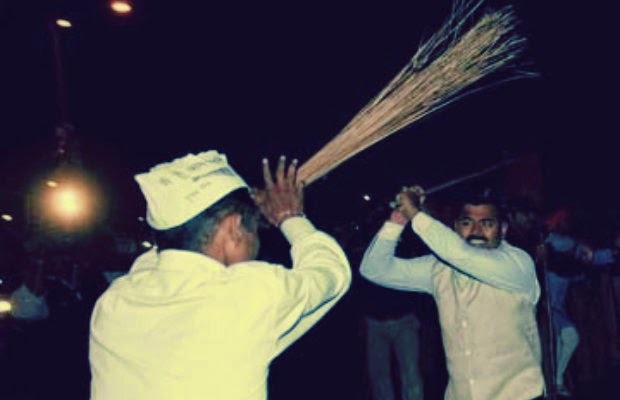 19) Attacking the anarchist Jhaaduwala. Kill them before this virus spreads. To conclude, AAP is wrong, it mostly is. It should not make any public place a demonstration area and every incident a reason to protest. But the BJP is no less. History says it, BJP has always indulged in violence, be it against political parties or any other community. Just blaming AAP for inciting violence is a lame excuse that only the national media can buy. 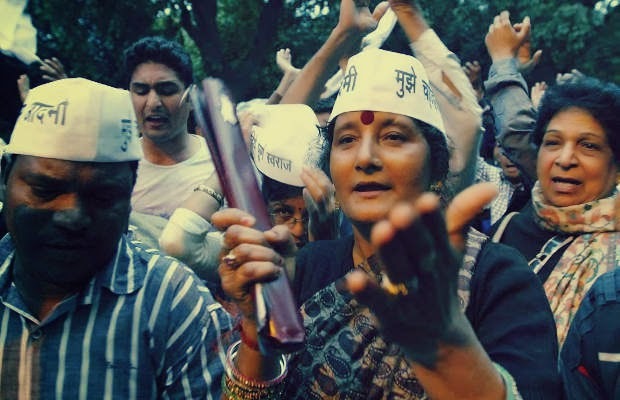 For others, the Lok Sabha elections will only mean a change of government, from corrupt, to communal, to anarchist. In the end, India will lose again, for there is no alternative left, yet again.